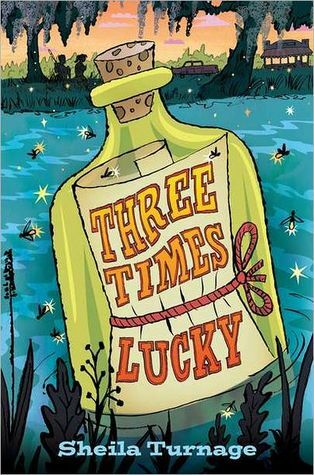 Three Times Lucky has moved to the top of my New Favorite Books list! I actually listened to this book on audio and the narrator is spectacular! Mo (short for Moses, since the Colonel rescued her from the floods during a hurricane and didn’t realize she was a girl until later) lives with Miss Lana and the Colonel helping to run their cafe and sending messages in bottles out into the river waters in the hope that one will find its way to her “upstream mother.” Mo and her best friend, Dale, are in the summer before 6th Grade when the story begins. When XXXXXX enters the cafe in the course of his investigation into a murder Mo, her friends, her family, and the small town of XXXXXX are inexplicably intertwined with the detective’s case. Secrets that have long been hidden will be revealed and nothing can ever be the same again. Mo is entirely likeable and genuine in her thoughts, feelings and actions. Her compassionate heart, strength of character and hidden hurt and fear over her early abandonment are evident in her relationships with Dale, Lana and the Colonel. Her journey is one of insight–of seeing what already exists for her. Like many of us, Mo is so busy searching for what she thinks she wants and doesn’t have that she misses the things–both tangible and intangible–that she DOES have. Mo’s journey is easy for a reader to identify with because her journey IS ours as well. In addition to Mo’s personal journey there is the very real murder investigation which grows increasingly complicated. The events are tightly plotted and the adventure/mystery aspect enhances the more subtle personal storyline. I found myself alternating between laughing, swallowing over the lump in my throat and rooting Mo on. I highly recommend this as an independent read from 3rd or 4th Grade up through adult.